As a web hosting provider focusing on ASP.NET hosting and dedicated to offer customers best hosting experience, we are happy to see that many professional review sites rewarded us as the best ASP.NET hosting for our affordability, usability and reliability. However, there are still some people don’t know much about us and wonder why we are the perfect choice for ASP.NET hosting. To figure it out, we worked out this article to introduce our company and services. Now go on reading and get to know the details. 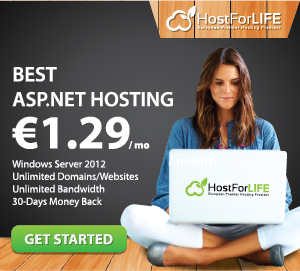 Why HostForLIFE.eu is The Perfect Choice For ASP.NET Hosting? For most bloggers, high costs of hosting service may be the biggest barrier stopping them from hosting a personal website. In order to help them widely get high-quality ASP.NET hosting service, we give a considerable discount to our service, which is billed at €3.00/month originally. In addition to the affordable price, we also provide 30-days money back guarantee, namely customers are able to cancel their accounts and ask for a refund if they are not satisfied with our service within the first 30 days. To offer all possibilities to our customers, we integrate our every hosting plan with the rich features, such as unlimited domain, unlimited disk psace, unlimited data transfer, instant account activation, latest Microsoft technology and easy-to-use Plesk control panel with 1-click installer. Webmasters are able to develop their sites easily with the user friendly Plesk control panel. The management of sites, domains, files, databases and mails is all included in this simple and clean control panel, which saves bloggers lots of time and energy. what’s more, 1-click installer of many useful applications is also a flashpoint of our Plesk control panel. For bloggers and webmasters, they are able to use the 1-click installer to install BlogEngine.NET or other blogging platforms by just clicking their mice several times. HostForLIFE.eu guarantees 99.99% uptime and high loading speed. To achieve what we have promised, we use 100% DELL servers with RAID 5 with SSD, Dual processors, BGP connections, 32GB+ RAM and redundant power system and equip our data centers with UPS, which keeps supplying servers with ventilation, air condition, lighting and heating. At the same time, we take advantage of multi-layer network service, maximum bandwidth and more other top-of-the-line technologies to make sure visitors get extremely fast speed to access the hosted sites. Currently, we operates data centers & networks in 9 countries across the globe including Amsterdam (Netherlands), London (UK), Washington, D.C. (US), Paris (France), Frankfurt (Germany), Chennai (India), Milan (Italy), Toronto (Canada) and Sao Paulo (Brazil) Data Center. All our data center offers complete redundancy in power, HVAC, fire suppression, network connectivity, and security. After a lot of hard working, we can say proudly that our customer service team is very responsive and professional. All of the team members are well trained and experienced. They work 24×7 to offer customers assistant via contact form, email and ticket system. Therefore, no matter when customers experience any issue, our staffs will respond them immediately and try the best to work out the issue. Besides, we invested enormous efforts on our knowledgebase. To ensure our customers are able to access to the latest technical information and learn practical skills, we update tutorials every couple of days in our official blog, hoping that customers not just use the hosting service we offer, but grow together with us as well. Based on the above points, we believe our readers have had a clear impression about our company and known why we are the perfect choice for ASP.NET hosting. With our affordable price, powerful features, fast speed and excellent customer service, site owners are able to focus on their blogging and leave the technical concerns with us. Therefore, if you are going to host a blog site with a reliable, robust and affordable hosting provider, HostForLIFE.eu is definitely your first option. ← Trust Levels in Windows Hosting: How Important Is It?